Are you one of those who admire stars and the magnificent and infinite space? Then this new video slot is perfect for you. With a theme based on magical stars in outer space this game is both interesting and mysterious. NextGen Gaming is the brains behind this video slot and as always they deliver an amazing game. We are more than happy to have NextGen Gaming as a part of our lovely Casino family and we are sure they will keep providing us with awesome games! This game has some awesome graphics and sound effects that really fits the theme well. The game mechanics are awesome which you will discover when you hit the spin button. Throughout the whole game there is a calm, mysterious soundtrack that in some way makes me think of infinity, this tune is amazingly relaxing, great job NextGen! Starmania is a video slot with 5 reels, 3 rows and with 10 paylines activated on every spin. Wins can be paid both from left to right and right to left, which is awesome. As you might already have figured out, this game has symbols that is based on stars. You will see three smaller stars in the colour purple, green and blue which are the basic symbols. There are also three bigger stars which looks like upgrades from the smaller stars, these appear in the same colours as the small ones but with a much fancier look. The last star symbol is a big red star that looks fantastic, this symbol has the most value of all the standard symbols in this game. 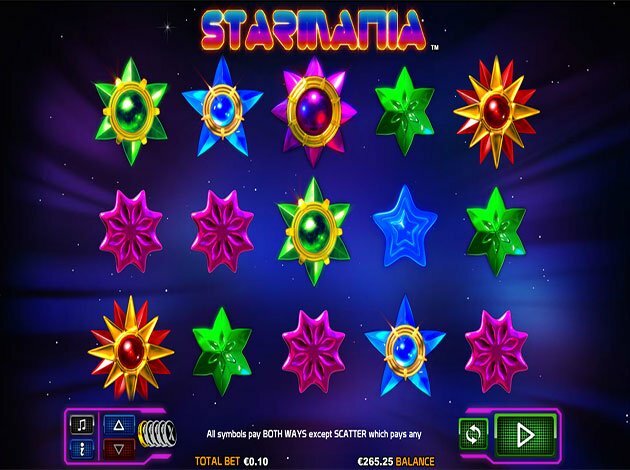 The fabulous game Starmania of course have some special symbols to maximize your winnings and gaming experience. First up we have the well-known and beloved wild symbol, this symbol will substitute for any other symbol if needed to form a winning combination, except for the scatter symbol. In this game the wild symbol can only appear on wheel 2, 3 and 4, and during the free spins the wilds will be stacked for massive big wins! The other special symbol is the scatter symbol, if you manage to land 3 or more of this one anywhere on the reels, you are rewarded with 10 free games with stacked wilds! The free games can be re-triggered the same way they got triggered in the first place. If you feel that you want to try out this epic game before you start playing with real money, you can always try the demo-version and when you get amazed you can log on to your Videoslots.com account and play for real money. With all this said, it is time for you to jump in the spaceship and aim for the stars. You can also teleport there by pressing the big picture above this text and start your way to wealth straight away. We on Videoslots.com wishes you all the best of luck with this amazing game, we are sure that you will enjoy it just as much as we did!